“When you open yourself to the continually changing, impermanent, dynamic nature of your own being and of reality, you increase your capacity to love and care about other people and your capacity to not be afraid. You're able to keep your eyes open, your heart open, and your mind open. and the only way that we could truly love others is to love ourselves. As I've mentioned before, here and elsewhere, I think the Hippies actually had it right. 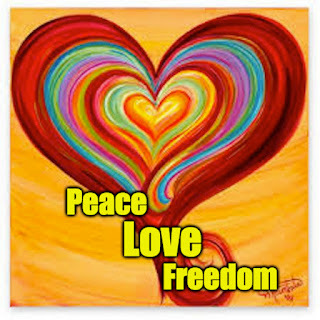 It IS all about Peace, Love, and Freedom. Although most of us were too young and crazy to pull it off at the time, many of us had been to the mountain top to be touched by the One Love during that era's Collective Kensho. We saw the Real Deal. But seeing that-- and even believing that -- isn't enough. The task of freeing ourselves to BE a peaceful and loving human being became the Mission -- and we quickly learned that it is no mean feat. It takes deep commitment, effort, discipline, courage and patience. In the Buddhist, Hindu, and Taoist worlds the term "Love" isn't generally used to refer to the Ultimate State of Being. They approach the Ineffable with different concepts and understandings. I think that is actually helpful to us Westerners. We are pretty sloppy with the word "love". For us, the word "love" is quite ambiguous. In English, what we call "love" can be a warm glow that emerges from the ethereal domain of unconditional, unselfish agape, or it can be the fiery emotion that erupts from the nether realms of green eyed monsters and wrathful, jealous gods. It's pretty clear that "I love you so much that I'll kill anyone who looks at you, and then you," isn't exactly what Jesus and Buddha had in mind when they taught about Love, right? So, it seems that a bit more precision would be helpful. Love Is More Than A Four-Letter Word! In the tradition of Mindfulness Practice, precision isn't just a matter of intellectual discernment. It's not simply a matter of conceptual definition. Love emerges from refining our ability to be fully aware of our own experience in the present moment. With Practice, Love surfaces not primarily as an emotional state, but as an open, equanimous, non-judgmental quality of consciousness. Love is our own inherent ability to be truly Present to Life, moment to moment, with an open, unbiased, and calm awareness. 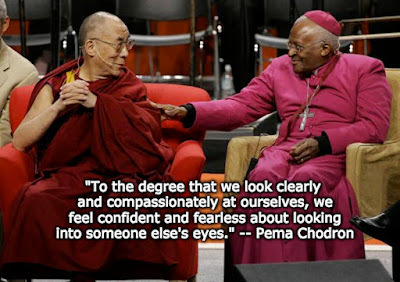 Compassion emerges spontaneously as a result. Unfettered by self-referenced ideas of good and bad (basically "what's in it for me") and the graspings and aversions that result, totally open to what is, not just what we want it to be, Love becomes our natural state. Just Sit On It, Buddhy! It may seem preposterous to imagine that taking the time and making the effort to Just Sit Still could ultimately lead to the realization of True Love, but that's the deal. The process of being Present to one's own breath, bodily sensations, feelings, thoughts, and awareness can open the Gateless Gate to our True Nature. Of course, simple doesn't mean easy. 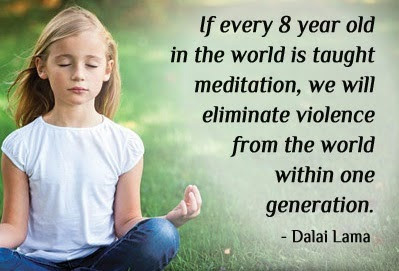 A regular meditation practice takes commitment and courage. It takes the willingness to face yourself -- and all that you've denied and repressed -- openly and honestly. It takes getting out of your head and feeling what's in your heart, facing and embracing the good, the bad, and the ugly. Yet, with persistent and gentle effort, Mindfulness emerges and deepens. With Practice, our minds clear and our hearts open to embrace and explore all the patterns of feeling, thought and action that operate to diminish and distort our ability to be peaceful and loving. Over time, both on and off the meditation cushion, we see clearly that the conditioned patterns of grasping and pushing away, and the resultant pains, fears, and resentments that emerge in ourselves and in others, are the root cause of human suffering. We also come to see clearly that, like everything else, those feelings are just energies, fundamentally insubstantial. They are just clouds passing through the infinity of a vast, clear sky. There, in the embrace of Mindfulness, Reality asserts itself. What has appeared to separate us from ourselves, from one another, and from the One Love that silently sings throughout all space and time is seen for what it is. At a certain point, it's power over us dissolves. Our True Nature emerges -- and we are free to Be who we truly are. At that point, Life itself becomes a Love Affair. Originally posted, April 24, 2015. Revised.